Not only do sweet peppers provide varying flavor profiles across their many colors, they also lend a myriad of health benefits. These peppers obtain their color from carotenoids and flavonoids- antioxidants that work to fight free radicals in your body. Sweet peppers contain negligent fat content and are a good source of fiber. Vitamins C and E have a strong presence in these veggies. The Sweet Pepper Gamut Sweet Cherry Peppers are mainly sweet but can have a little spice. Roasting Pimentos are excellent for roasting due to their high sugar content. Red Bell Peppers are sweet, provide the perfect crunch when raw, and are also delicious once roasted. Orange Bell Peppers do not have as much flavor as their red counterparts but are just as sweet. 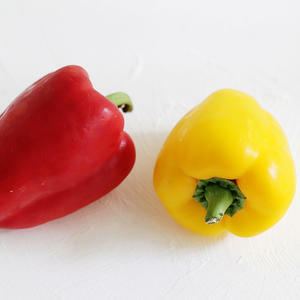 Yellow Bell Peppers are more mild-tasting but do have a sweetness all their own. Sweet Cubanelle Peppers are delicious when stuffed and can range from yellow-green to red once ripened. Green Bell Peppers are very crunchy and have a "grassy" flavor to them. Italian Frying Peppers are mild-tasting and wonderful when fried in olive oil. Purple Bell Peppers are best served raw and have mild sweetness. Whether you eat them raw chopped into a salad or prefer to enjoy them in a dish like our Spicy Tofu Fajitas with Peppers, Onions, Tomatillo Salsa & Sour Cream, sweet peppers offer color and flavor to any meal you choose.